If you are not new here you might know that I have sensitive skin, redness and pimples are a frequent problem. Although, my skin is more or less under control, redness, blemishes and irritations can show up depending on diet, weather and the time of the month. Hence, I'm always on the look for new products that work on sensitive skin. 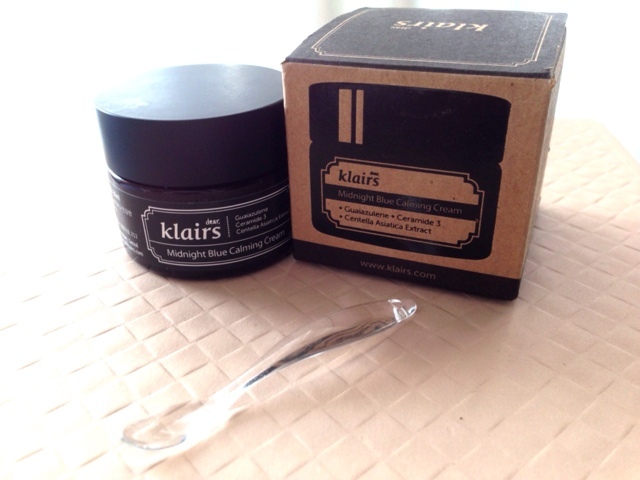 When Wishtrend asked me if I was interested in trying out their new Klairs Midnight Blue Calming Cream*, I was happy to give it a try. Dear Klairs is a brand exclusively by Wishtrend*, established in Seoul in 2010, focusing on skincare problems for those with sensitive skin. Their products are suitable for all forms of sensitive skin. Klairs do not test on animals, products are alcohol free, paraben free, free of artificial coloring and ecol-friendly. They have a nice selection of skincare products, that seem to work very well on dry sensitive skin. 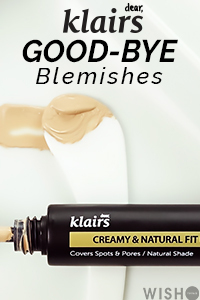 I didn't had the chance to try their skincare products expect the lovely Klairs Rich Moist Soothing sheet mask (reviewed here) and the Klairs Supple Illuminating BB cream (reviewed here). Wishtrend description: The Midnight Blue Calming Cream is a comforting moisture cream that provides the skin with intense, soothing hydration. It is formulated using revolutionary Guaiazulene combining with Centella asiatica extract and various peptides to recover damaged skin cells from stress and stimulation. At first I was confused, because it's called a moisture cream for intense hydration and the instruction says to apply it on the affected area. Latter, Wishtrend confirmed it: it's a not a moisturizer for the whole face. It is a special treatment for spots and a repairing & calming cream. So, it's a moisturizing cream to calm affected areas, like spots caused by external factors, or just sensitive or irritated areas. hhmm this sounds exactly what my dehydrated and sensitive needs. There are some red flags on cosdna. Simmondsia Chinensis Seed Oil, Cetyl Alcohol, Stearic Acid and Triethanol amine, all rank 2 as acne triggers. I patch tested it and had no adverse reaction, but skin is YMMV so be careful if you are sensitive to some of the ingredients. 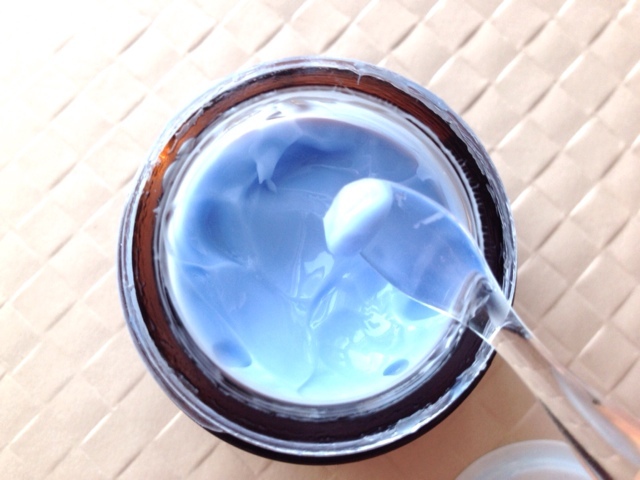 The ingredient which gives it its blue color is Guaiazulene (0.03%). Its a herbal ingredients extracted from Chamomile which has natural deep purple color and this makes the blue color of the cream. It supposed to sooth and cool down inflammation. According to Wishtrend it has been proven in clinical test in Japan that Guaiazulene has positive effects on skin; a 89.7% improve in sunburn healing, 60.6% of eczema, and 86.5% of ulcerative skin disease. Then there is also Centella Asiatica Extract: Centella asiatica has been shown to be effective in wound healing, treating scars and stimulating synthesis of collagen, hyaluronic acid and cell growth factors, thus helping to maintain and restore skin elasticity. It also protects the skin from UV damage, likely by activating antioxidant synthesis. Hence, has an anti-aging, acne and healing function in skincare. I reviwed a product before with Centella Asiaticaas main ingredient; the Cosrx Centella Blemish cream. Niacinamide: one of my favorite ingredients, a scientifically proven whitening and brightening agent. Wishtrend forgot this one to put on the ingredient list on their website, because it is printed on the box..? I also see many of my favorite moisturizing ingredients: Sodium Hyaluronate, Ceramide 3, Parkii (Shea Butter), Argania Spinosa Kernel Oil, Simmondsia Chinensis (Jojoba) Seed Oil, Sodium Hyaluronate. 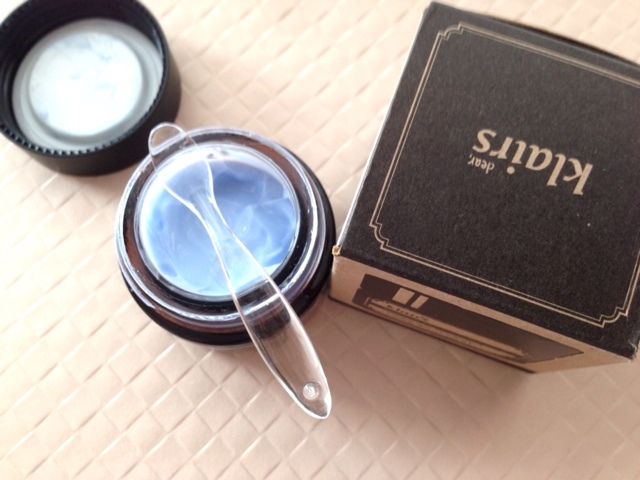 The product comes in a brow glass jar with a spatula in the shape of a small spoon. I must say I love the spatula, it's so easy to use and looks just cute. The jar contains 30ml of product, which is not much but remember it's a spot/area treatment so not intended to be used as a regular moisturizer. All the necessary information is printed on the cardboard box, in English and Korean. Yep no leaflet inside, remember it's Klairs - eco friendly. The instruction says to apply a small amount on the affected area (sensitive red skin, blemishes, irritations...) in the morning and evening after your regular routine. For some reason I thought it's only for nighttime because of the name, but I guess it's fine for the AM routine. The scent is pleasant not overwhelming, difficult to describe, I would say flowery herbal fresh. The texture is silky and spreads very easy, a small amount is enough to cover a large area. Oh just look at that color; it's ocean blue, so pretty. When I first started using the cream my skin didn't have any irritations or pimples, so I spread a small amount on my entire face to see how it feels. As expected the cream is not as hydrating and moisturizing as my regular face cream, but I do think its moisturizing enough for oily and oily-to dehydrated skin types. Later, I had the chance to test it on two just 'forming pimples' that popped out on my cheek. So I spread the cream on the affected area before going to bed, I didn't use any other spot treatment. You know how it is with pimples? they tend to increase in size the next morning and appear larger. Well, I wasn't sure how the Klairs Midnight Blue Calming Cream would work on blemishes, but to my surprise the two pimples were significant smaller the next morning and the inflammation was gone. 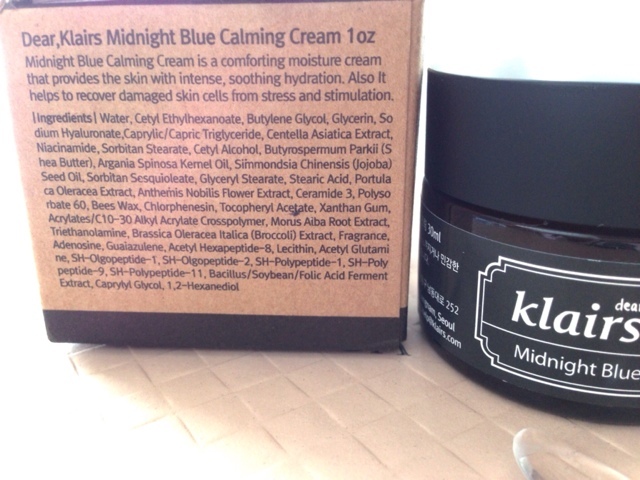 A couple of days later I had red patches on my cheeks and some irritation spots (probably hormonal), the Klairs Midnight Blue Calming Cream seemed to calm and sooth the affected skin. It's not a magical redness and pimple eraser but I definitely see the calming effect it has on my skin. I have been testing it for 2-3 weeks and so far I like. I have to admit that I sometimes use in on my entire face, hoping to calm done general reddens and it just feels nice, so cooling. 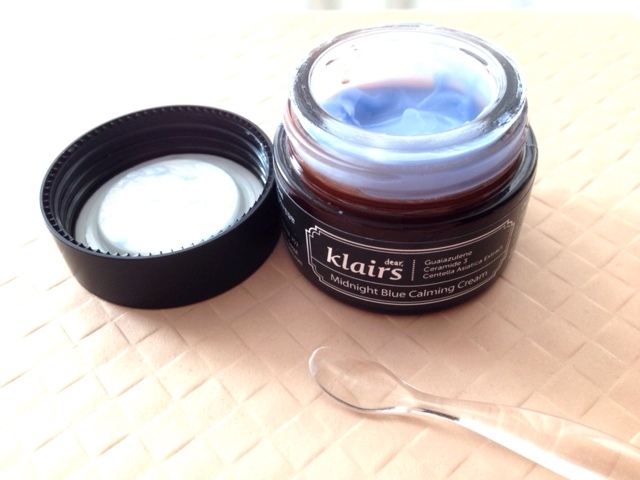 Compared to other spot/treatment creams the Klairs Midnight Blue Calming Cream is moisturizing, actual the first few ingredients are emollients. In general I would say this cream is good at calming redness, healing blemishes and moisturizing at the same time. The texture is silky, very pleasant. It might not be the best treatment cream for sensitive skin but its gentle enough for everyday use and delivers on hydration. You can purchase it exclusively on Wishtrend* here for 24.50$. nice silky texture and the color!!! 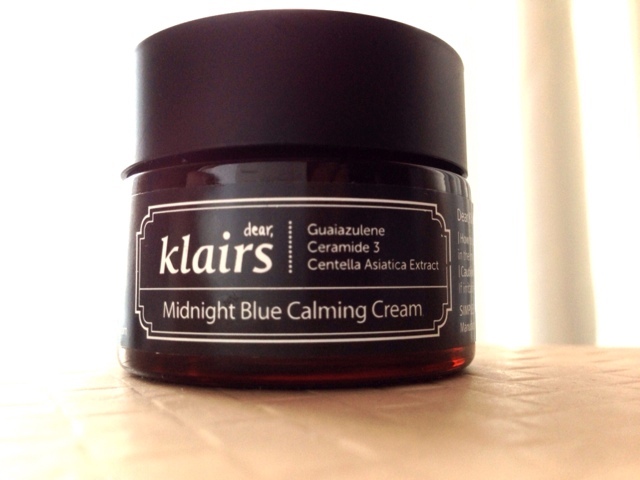 Disclosure: The Klairs Midnight Blue Calming Cream in this post was provided by Wishtrend. All opinions and recommendations are my own. Affiliate links are marked with an asterix *. Shopping with them supports the blog. My skin isn't dehydrated, so I guess it wouldn't be for me, but the ingredient list sounds lovely.